Bamboo Charcoal Far Infrared Ray Protection Belt - High quality Taiwan Bamboo Charcoal Far Infrared Ray Protection Belt provides by Jean-Modern's Ind. Co., Ltd.
Applicable to middle-aged friends, young friends, the working people, office workers, sports and other back pain and postpartum, postoperative support needs. 許可字號: 衛署醫器製字號. 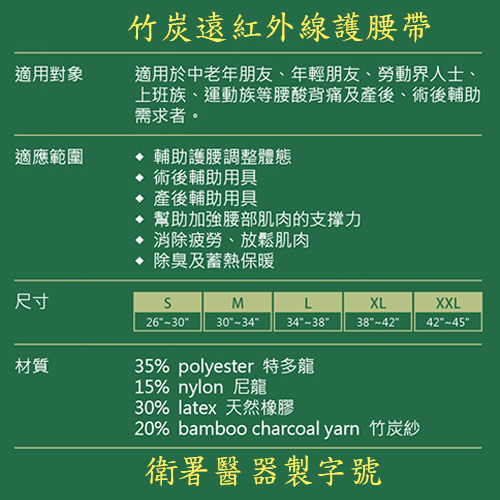 20% Bamboo Charcoal Yarn.竹炭紗. Professional and Durable. Good Quality, Beautiful Appearance, Attractive design. OEM and ODM service provided.